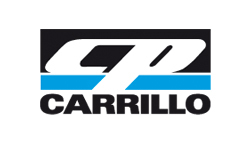 CP Pistons and Carrillo industries have joined forces with one goal in mind. Offer high quality performance products with excellent customer service. „It‘s a unique partnership,“ said Barry Calvert, President of CP-Carrillo.“ Both companies strive to provide the best internal engine components to the customer. 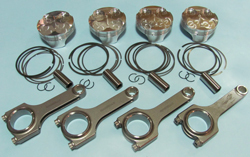 Offering both, pistons and rods is a tremendous added value for the customers. After Barry Calvert finished the work with JE Pistons, he and his brothers focused their expertise on the high-end racing market. With the claim to make the best High Performance Pistons in the world and with the support of the Pankl Group they reached it after a view years. The ultimate components in the latest four stroke technology. Custom made pistons possible. Minimum quantity 4 pieces. 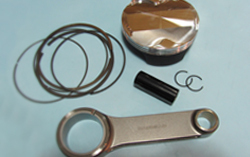 This high-quality connecting rod is milled from forged pieces, the surfaces of which are then packed by shot-peening. Further highlights of CARILLO con rods are their light weight and high-quality screws. CARILLO, the connection between pistons and crankshaft. A guarantee for maximum stability, high quality. For more than 20 years we have been using these connecting rods for tuning. Special designs from specific drawings or samples are possible!